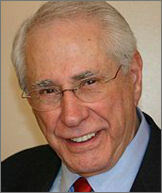 Mike Gravel was born in Springfield, Massachusetts, to French Canadian immigrants. He received a B.S. in Economics from Columbia University, New York City, and holds four honorary degrees in law and public affairs. In March 2008, he switched to the Libertarian Party and competed for its presidential nomination. He currently lectures and writes about governance, foreign affairs, economics, Social Security, tax reform, energy, environmental issues and democracy. Books authored by Senator Gravel are Jobs and More Jobs, and Citizen Power. He lectures and writes about governance, foreign affairs, economics, Social Security, tax reform, energy, environmental issues and democracy. Recently published books are The Kingmakers, co-written with Professor David Eisenbach, an analysis and polemic on corporate media and how it distorts our political dialogue, including Mike's own campaign, A Political Odyssey, co-written with Joe Lauria, is an examination of Mike's career in politics, his personal life, his fight against the Military-Industrial-Complex and the rise of US imperial power. And also The Voice of A Maverick, a compilation of Mike's speeches and writings from his 2008 presidential campaign.